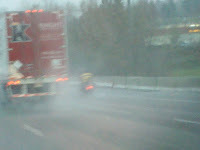 Driving home from work yesterday, buzzing down a rainy I-5 from Portland to Aurora I spotted a motorcylist in my rearview mirror. 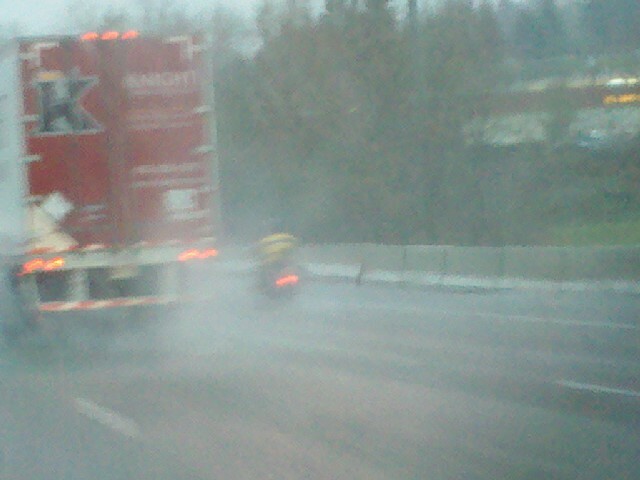 Huge Harley, bright yellow jacket soaking up the rainwash from my tires. I was filled with envy as I wondered how much of a pansy I was for being in a car while someone else was out riding and enjoying their bike, weather bedarned! As he passed me I was finally afforded the view I never get to see...exactly what it does look like when a crazy motorcyclist decides to ride in the wind, rain, and low temperatures. And guess what? It looks dangerous! The motorcycle flew by and became a blurry streak of nothing, the yellow jacket barely visible. I thought of all the times I've ridden in weather like this, braved the cold, the wind, the pounding rain that feels like pellets smashing against your heavy gear as if you have nothing on but a pair of thin tights. And to think I've been doing this in a black and gray (or blue and black) jacket, my visibility turned to nil. Low conspicuity may increase the risk of motorcycle crash related injury. Increasing the use of reflective or fluorescent clothing, white or light colored helmets, and daytime headlights are simple, cheap interventions that could considerably reduce motorcycle crash related injury and death. Be safe and be smart this winter if you are one of the brave riding! I'm starting my Christmas List and what's on the top may be a brighter helmet and a jacket with reflective strips. That is, if I can just quit dreaming about a new BMW!